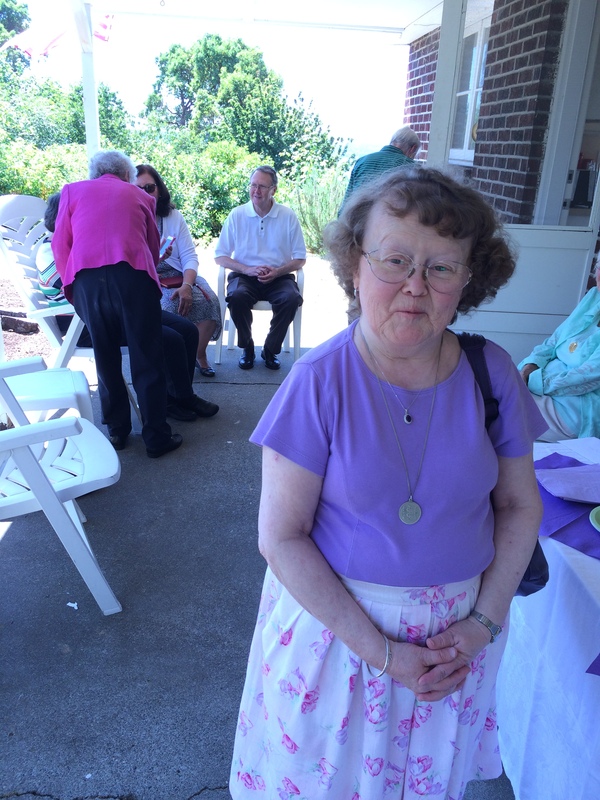 I didn’t think it would take me this long to write about last Sunday’s Celebration of Life for my Mom – now it is Father’s Day. Maybe it is appropriate after all, I can’t picture one without the other. The truth is, I was so exhausted I spent the week resting and sleeping. Yesterday I seem to have spent most of the day dozing or sleeping – couldn’t keep awake. Eddie and I had been working on getting things done for the Celebration of Life – meanwhile he was wearing himself at work as well. 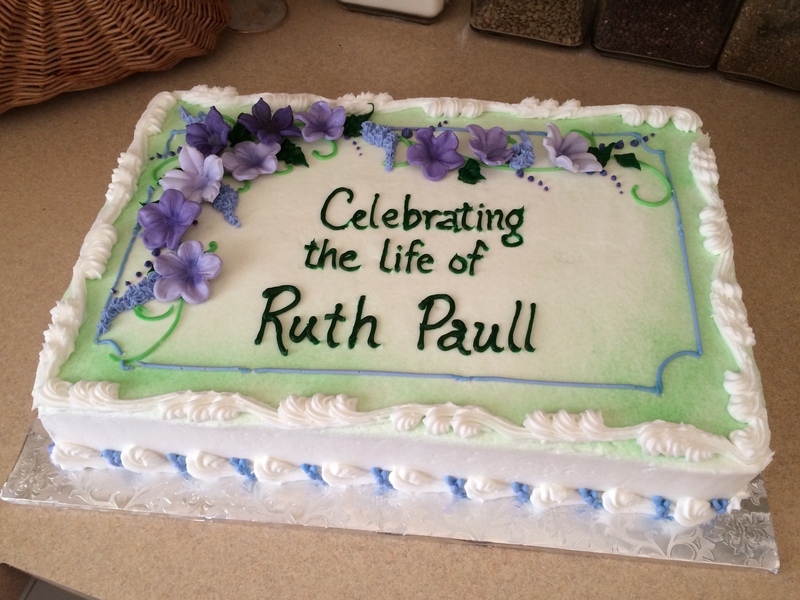 I had first heard of a Celebration of Life in the 80’s when I was going to Northward Congregational Church in Conn. 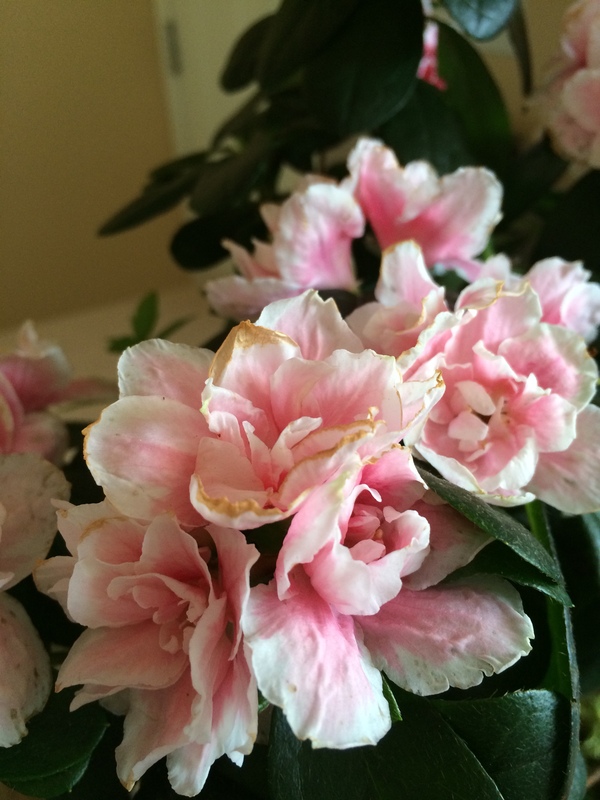 When someone died, that was how they looked at it – not as a sad, mournful event but a celebration. I really liked that and idea and found it more comforting. We did a Celebration of Life open house for Dad in 2000, inviting people from all the places Dad knew people – it was quite a group. I was concerned it would be sad and I would start crying. However, it was a delightful time and I knew Dad would have enjoyed it. 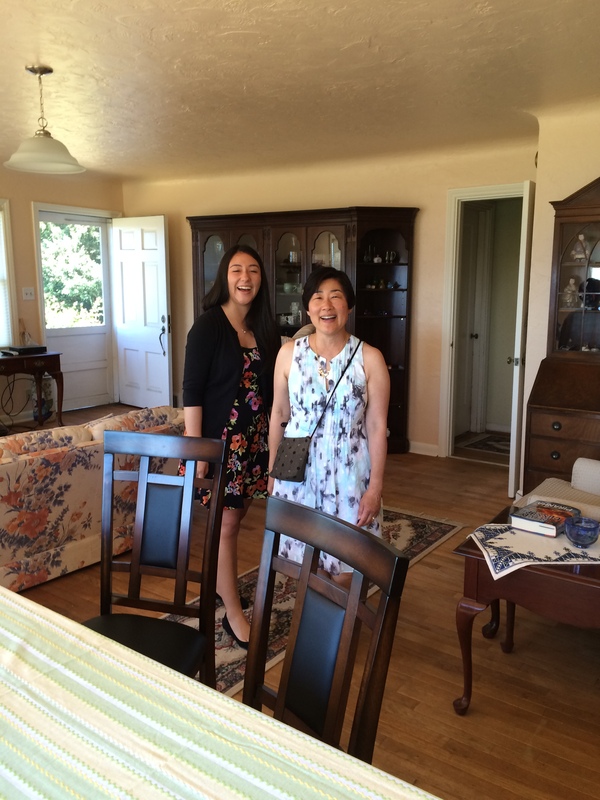 Things have certainly changed in 15 years – not many people left who knew Mom and I will admit to being late with the invitations. We invited the Domino ladies, the neighbors, people from Breakfast Club, my Caretaker Support Group, Future of Flight, and Kathy. I had a postcard made that I gave out and decided whoever was supposed to come would be here. 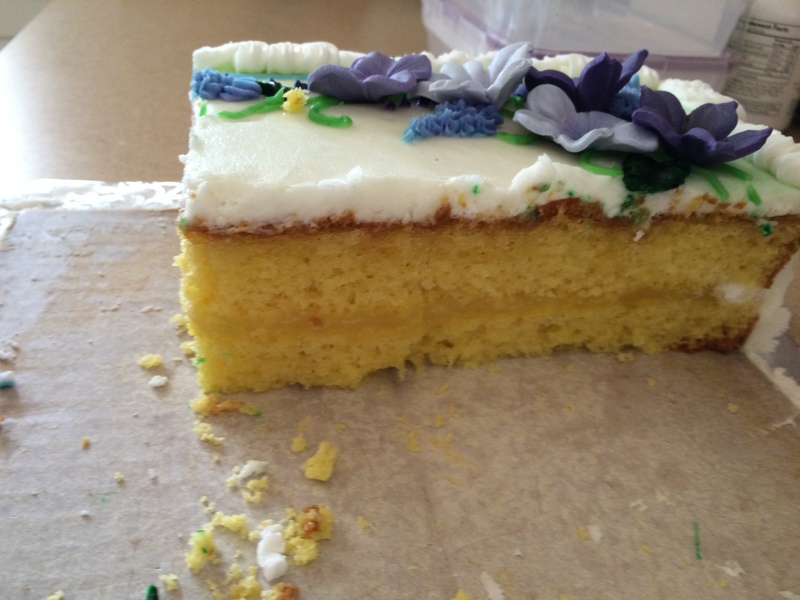 I arranged a cake with Robbi, our resident cake designer at Breakfast Club and had her deliver it Sunday morning. Robbie did such a wonderful job on the cake. I was very pleased with it. 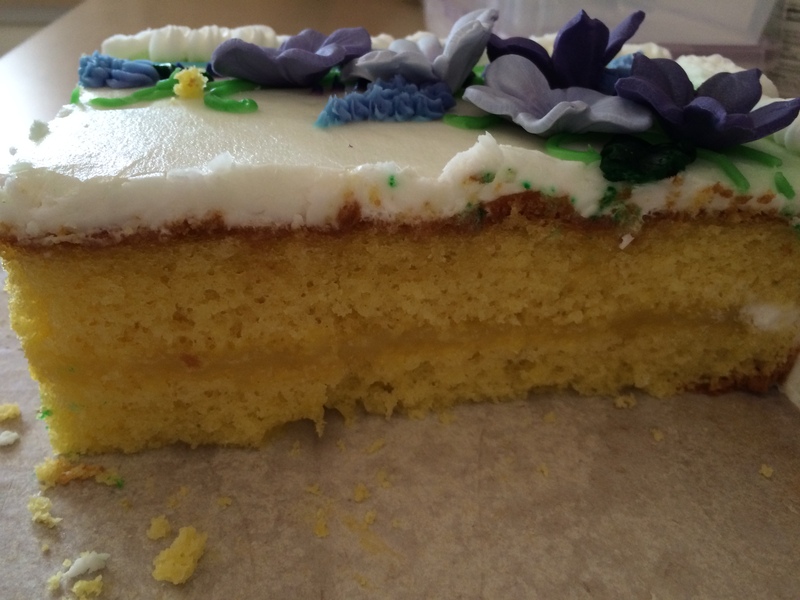 She did lemon cake with lemon curd, plus I asked her to put some lemon flavoring in the frosting. 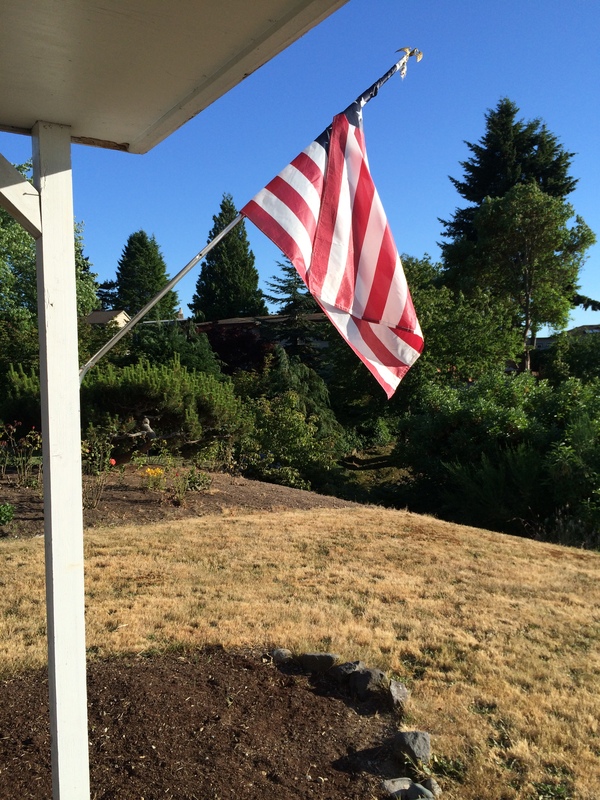 It was Flag Day, Eddie put up the flag for the day – Mom and Dad used to put it out most every day. I ordered a fruit tray and vegetable tray from Fred Meyer, each with a dip. I had lemonade with a bit of orange flower water and Vickie lent me her spigot jug. 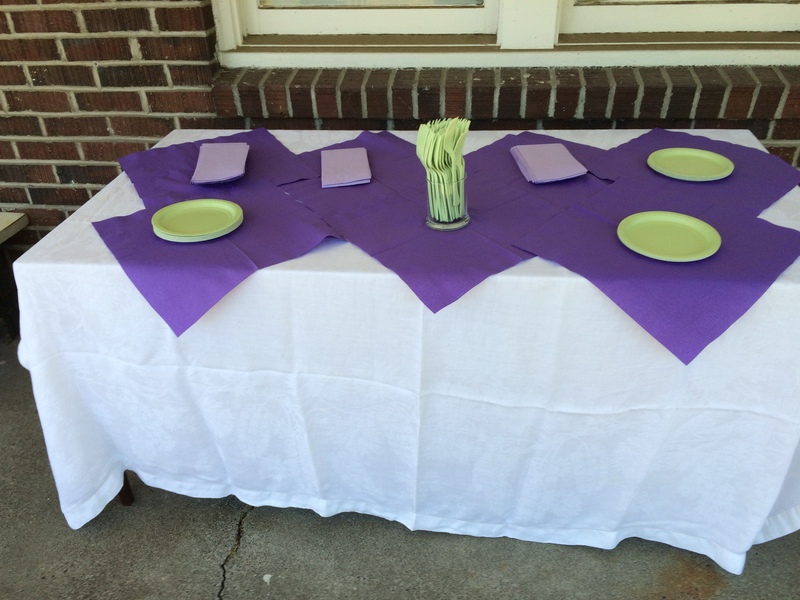 I used white tablecloths and put the two card tables on the porch for the food and lemonade and one of the outside tables with another white tablecloth for the cake. 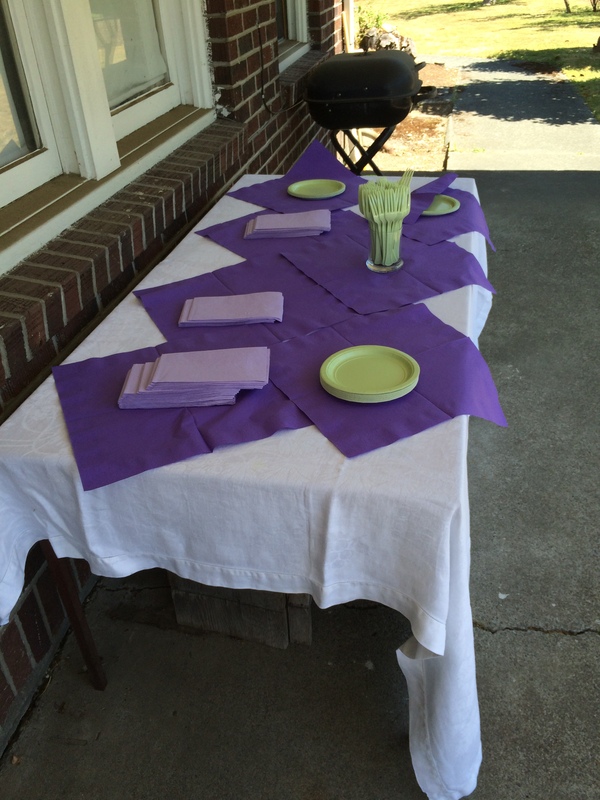 I used lavender napkins, light green plates and forks, then purple napkins to put under the trays. The card tables worked very well. 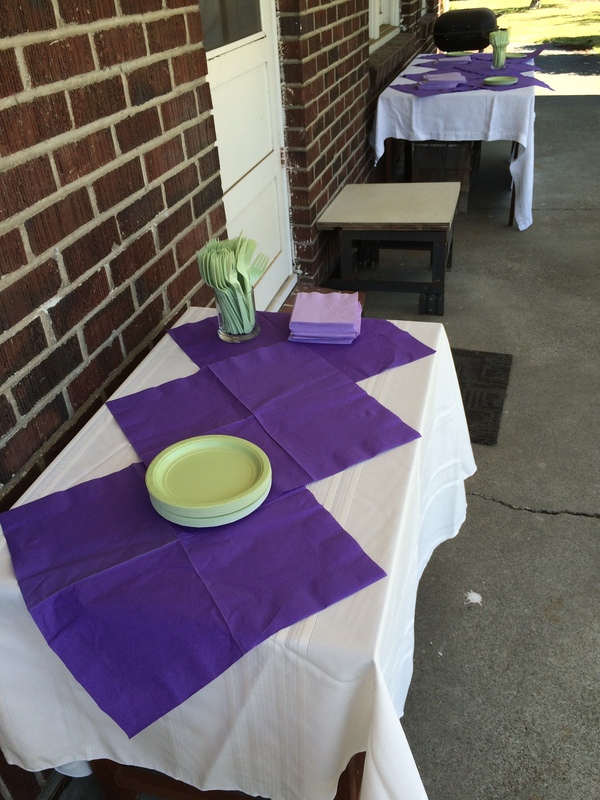 This is the table for the cake – I had to put napkins and plates to keep the purple napkins from flying away. 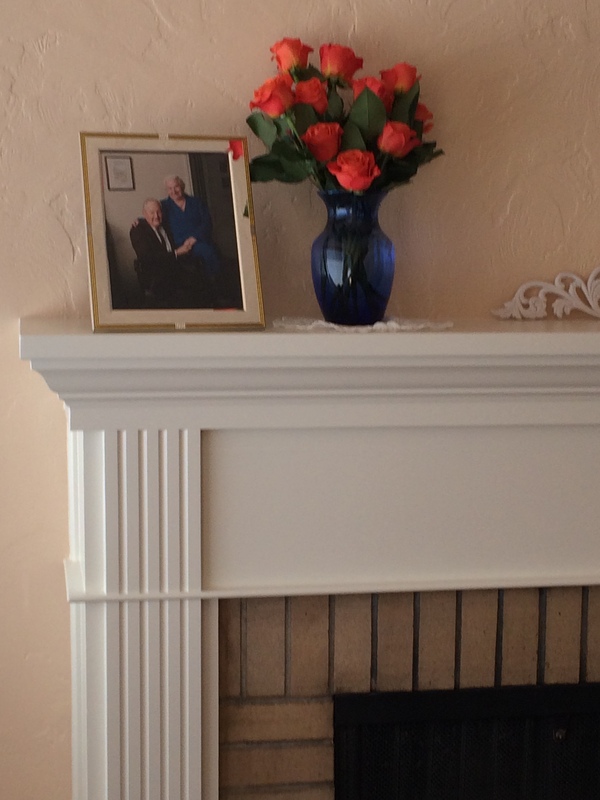 I planned to buy roses for Mom and put them on the mantel with the 50th anniversary picture of both of them. 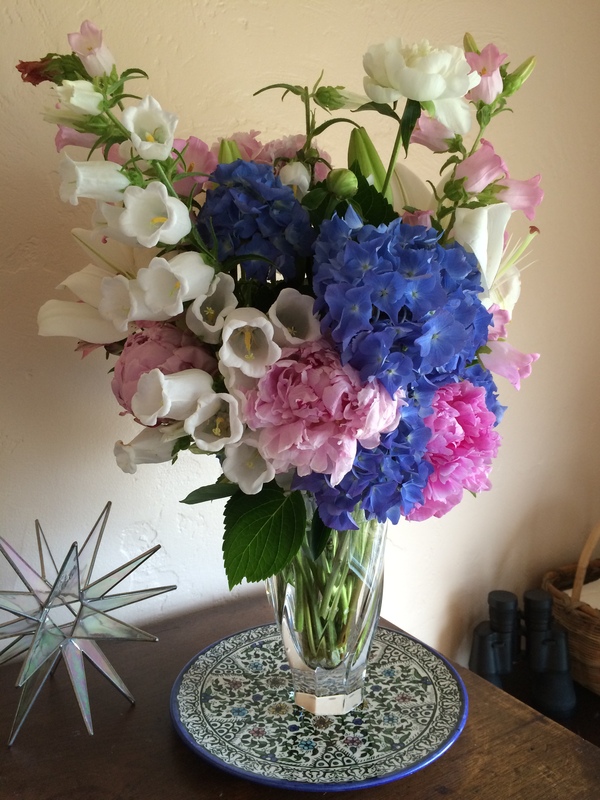 Eddie picked them for me – he always chooses just the right thing. It worked out so well! Mom always enjoyed her rose garden. Candy sent roses but unfortunately there was aspire in the works and the florist didn’t send them for whatever reason. I know Mom would have really appreciated the thought. 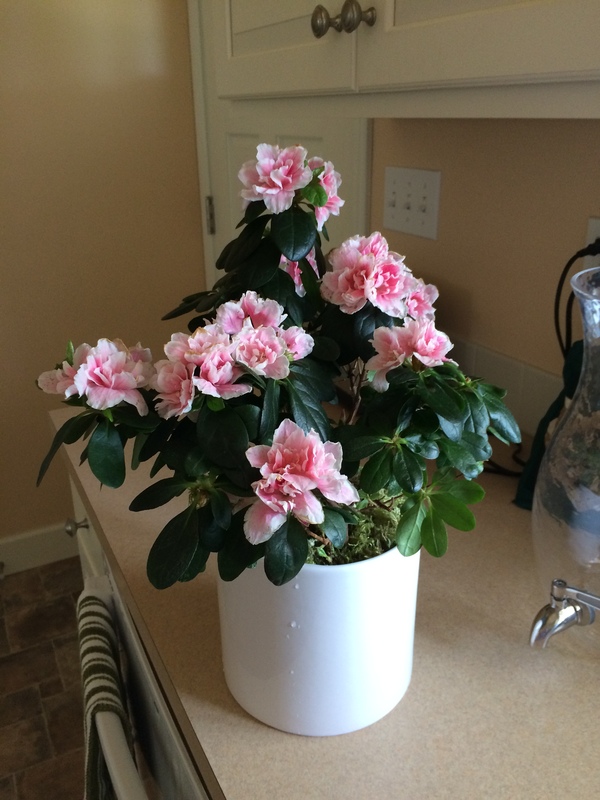 Ellen sent a lovely azalea, one of Mom’s favorite flowers. 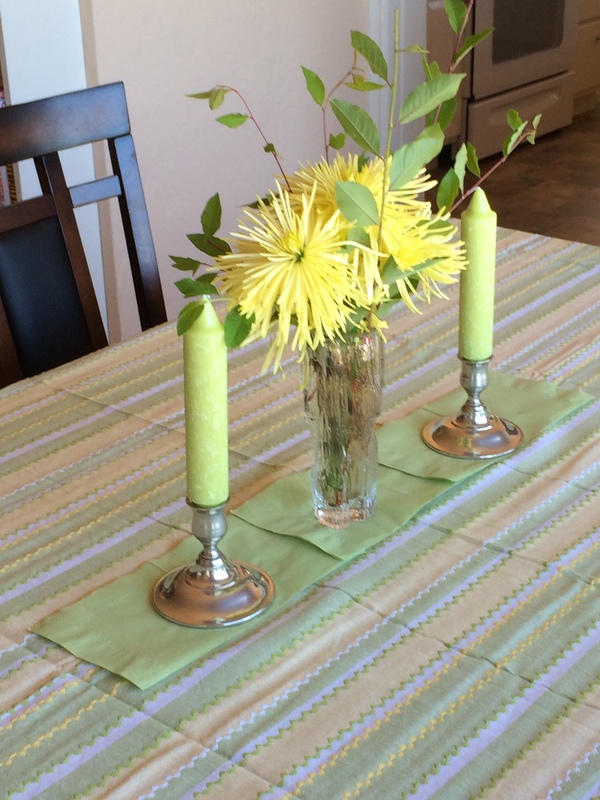 I wanted to do something interesting with the dining table, so I brought out my newest tablecloth, used the spiky chrysanthemums Eddie bought for me and put some candles and candlesticks with them. 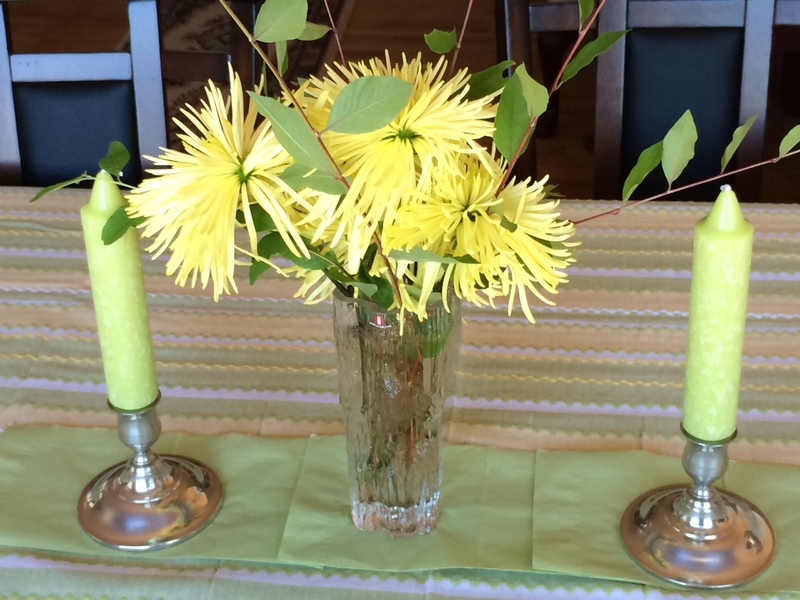 I was going to use the Swedish crystal candle holders, but Eddie liked the silver ones. As I looked at it after I finished, I think he was right. 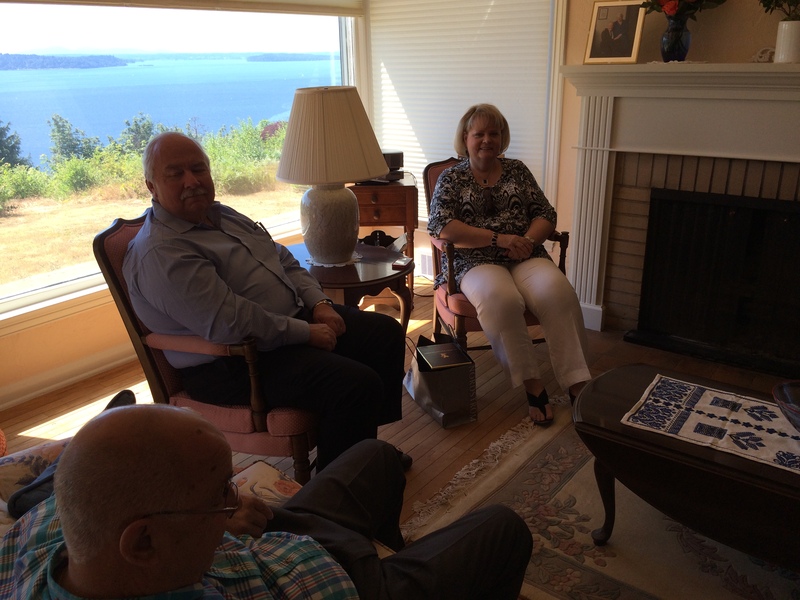 My long time friend Charlotte came, The Dusslers from down the hill and Vickie and Rich Bergquist all came about the same time. Charlotte was looking through the book Candy sent. 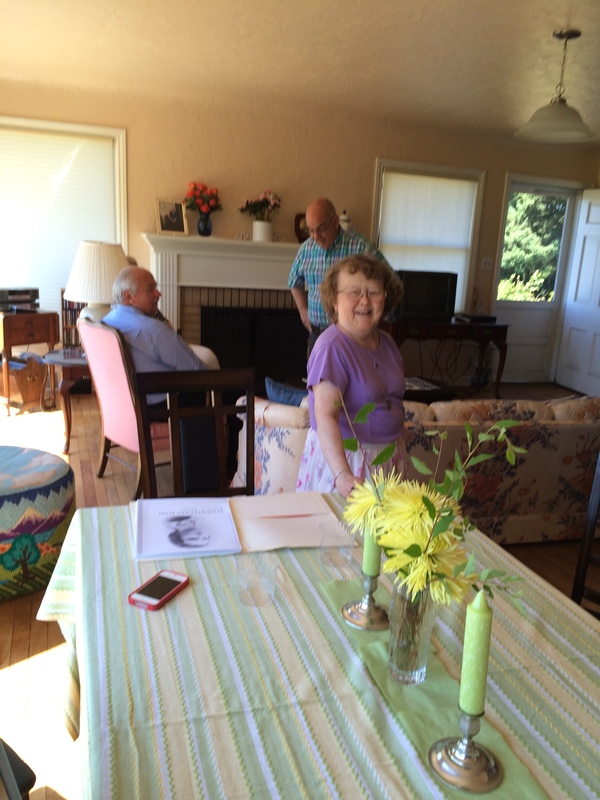 she wrote it about Mom and several people enjoyed looking through it – some saw pictures of themselves in it. 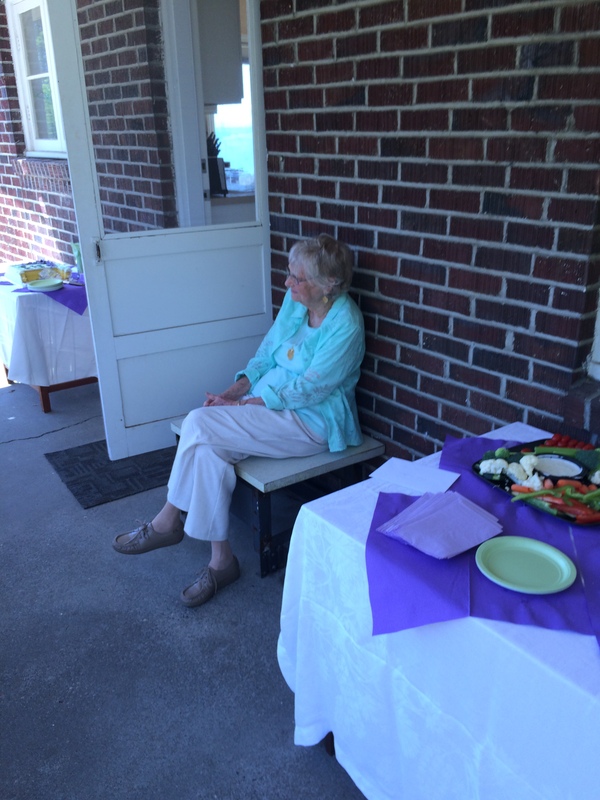 No Celebration of Life would be complete without Kathy. 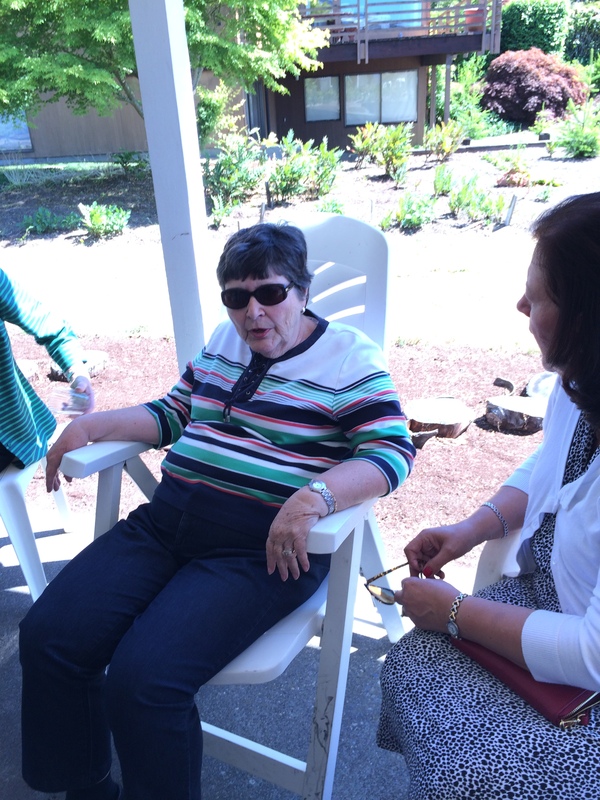 she started out as Mom caregiver, became a good friend and now she is our very good friend. 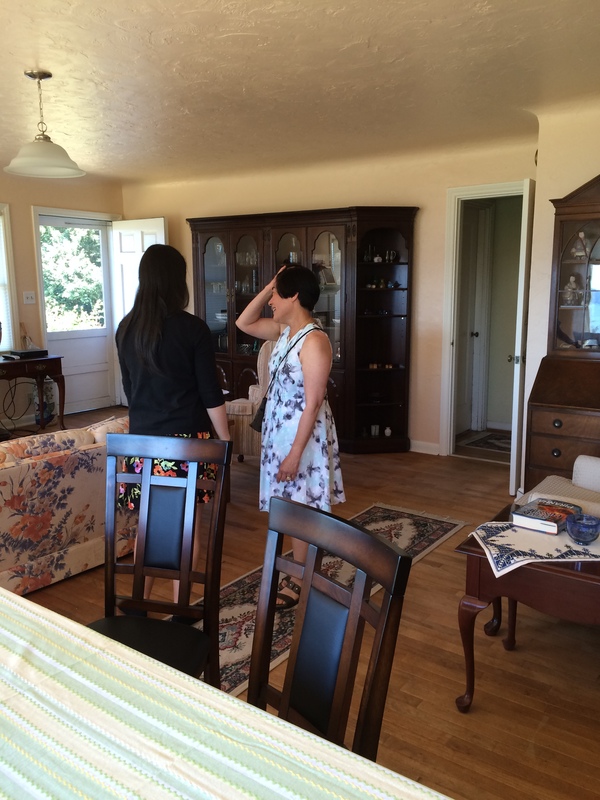 she helped so much with dealing with Mom, organizing, advice, answers and many, many other things. 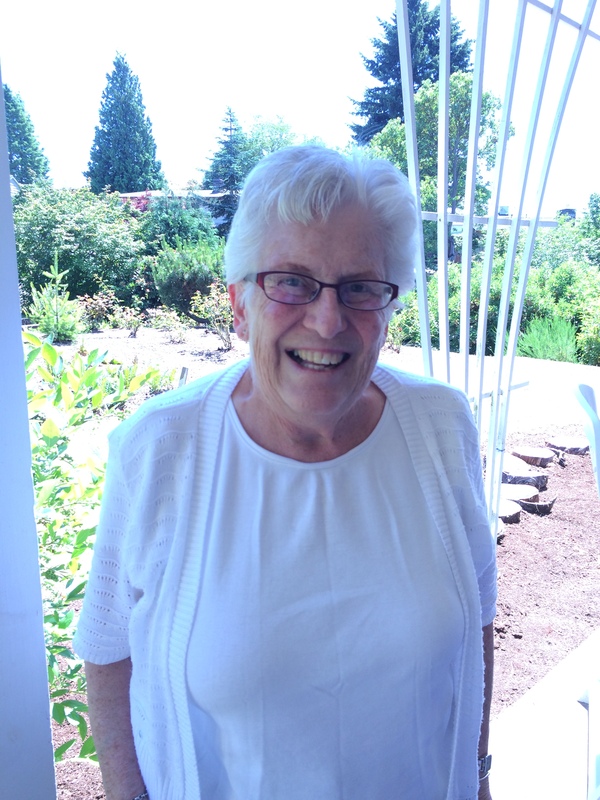 Marilyn Silworth who lives up the street. Mom would go walking with her husband Ron most days. Ron would call and ask if Mom was going for a walk and Mom was delighted to go with him. Charlotte and I both wore lavender. 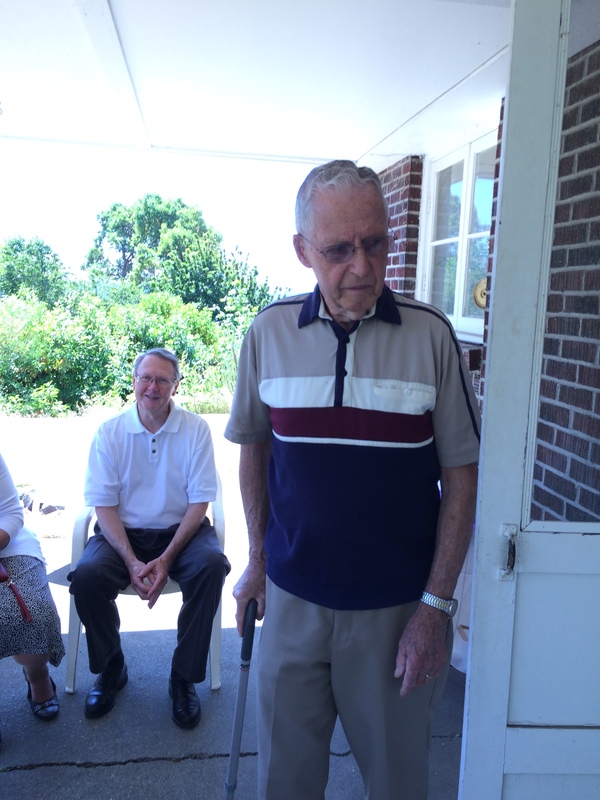 In the background is Delores Allen with Ken and Maria Carter who live across the street. That’s Claire McGee in the foreground, she lives up near where the school bus used to stop. This is Peggy Johnson, she lives up near Claire. 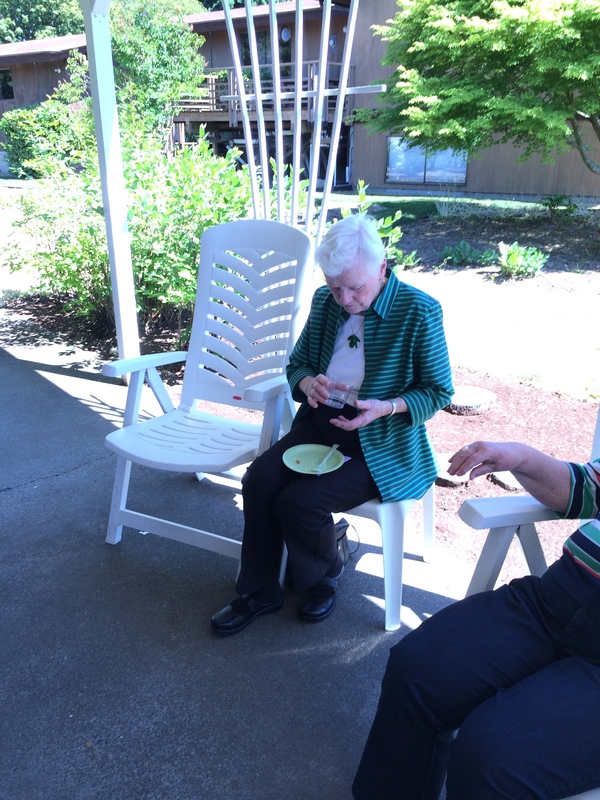 She is 90 or more and we see her sitting on the ground weeding her yard all the time. 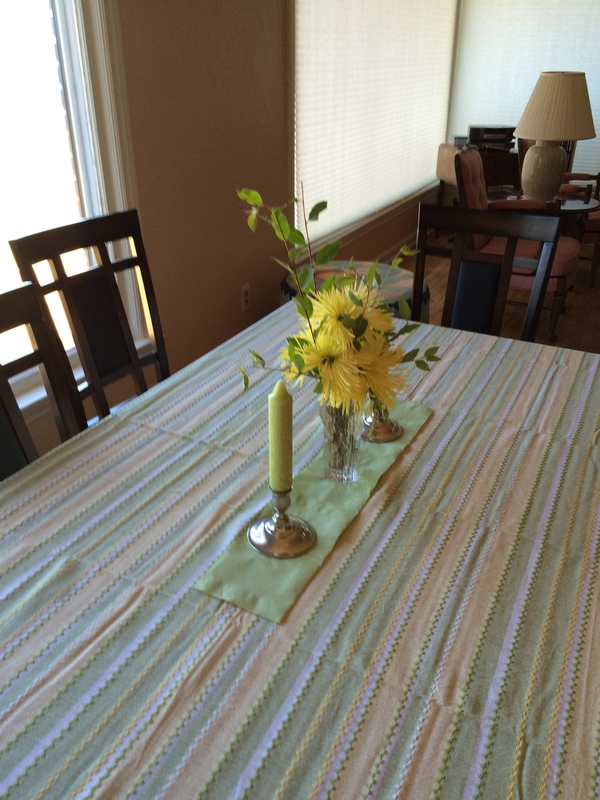 The table worked out so well. I kept it simple. 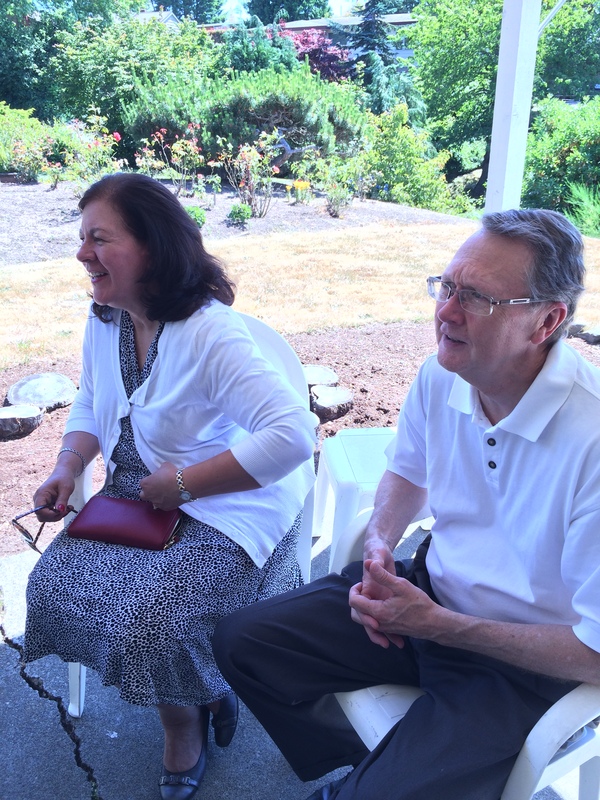 Bob allen – he and Delores live next door and have been wonderful neighbors for Mom and Dad as well as for us. 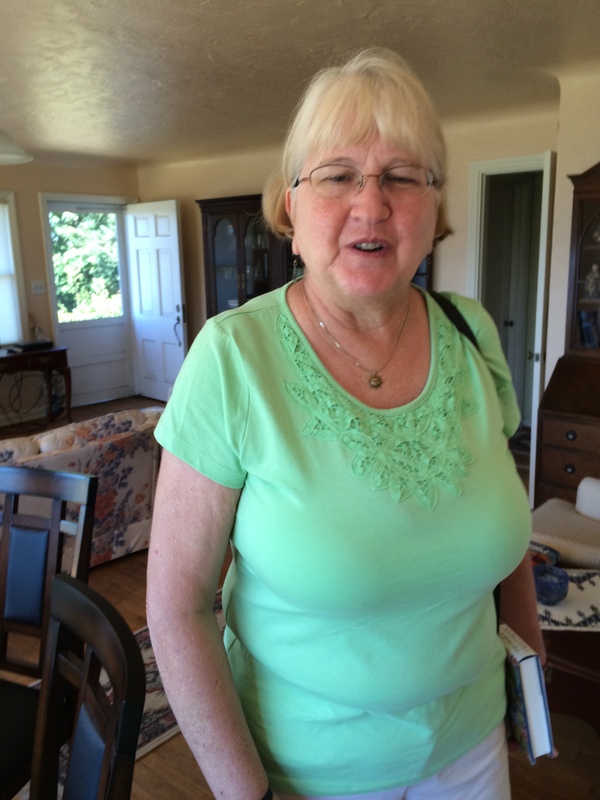 This is Sheila Woodward – she lives on the other side of allen. Next to her is Maria Carter. 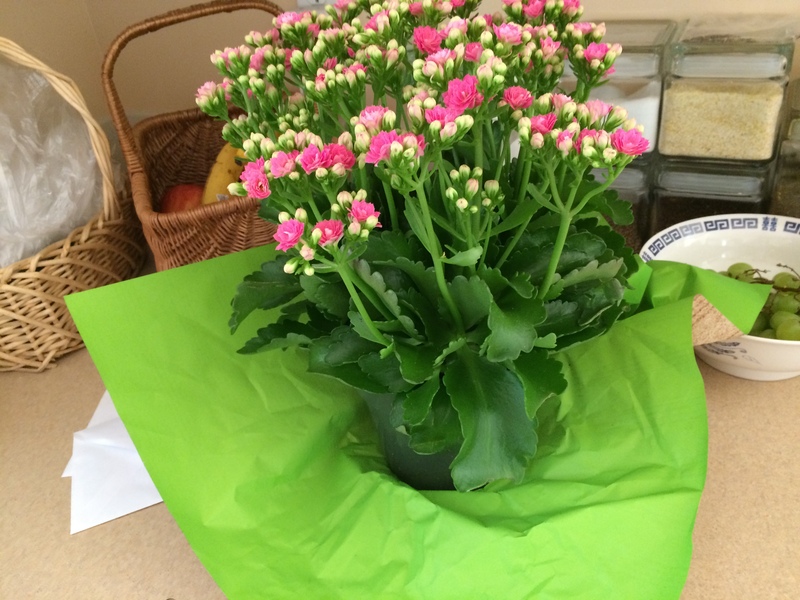 The Carters brought a lovely plant and it was on the table with the food. Sandy from the Future of Flight brought a lovely bouquet. 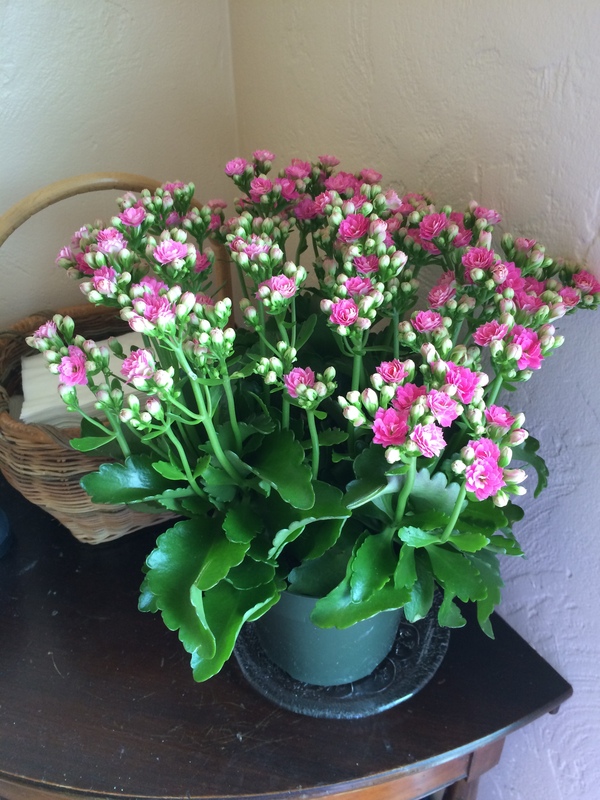 We are enjoying the Carters’ plant in the dining room. This is Delores Allen – I’m sure she would appreciate her front showing instead of her back. This photo is driving me nuts! 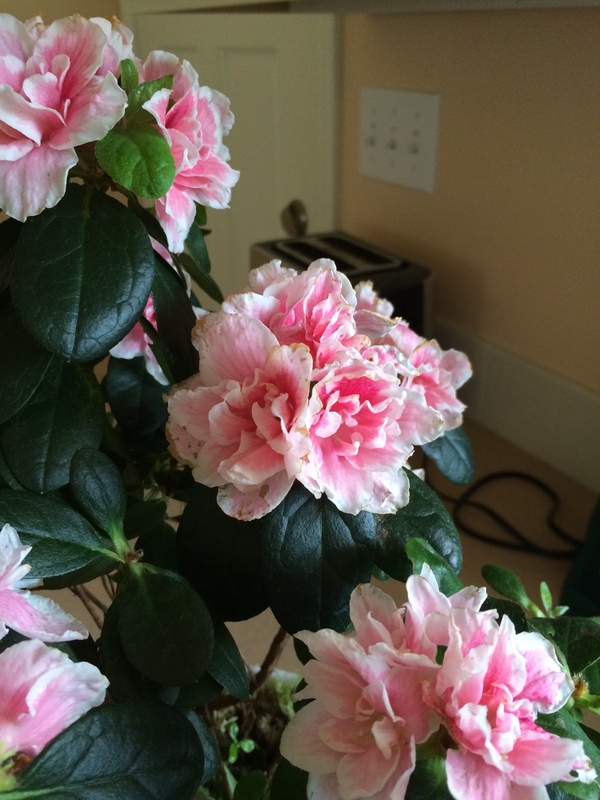 I lightened in iPhoto and it was great – now it only comes out dark. That means you can’t really see rich and Vickie very well. I am going to wait for a day or two and see if iPhoto and WordPress will work together finally. 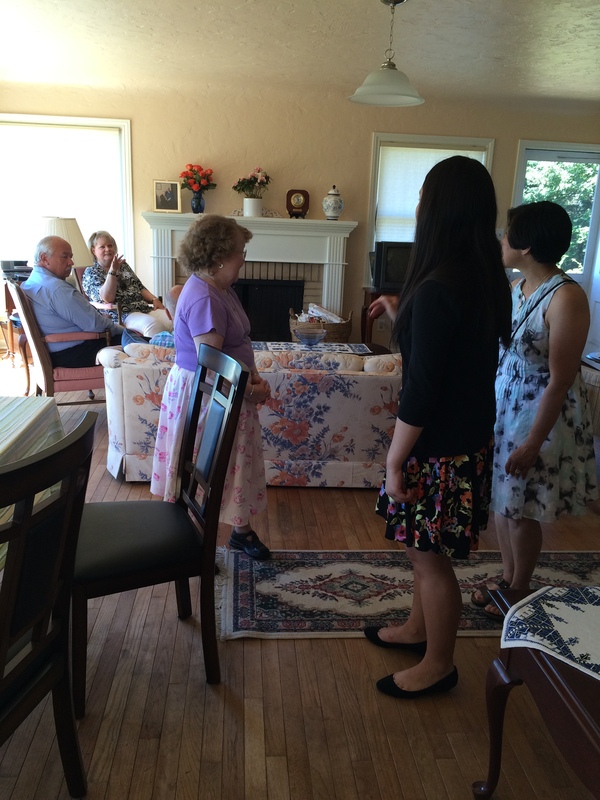 We had a great time and enjoyed all the people who came. I was very surprised and delighted to see June Hawkins, she is one of the domino ladies and has been diagnosed with pancreatic cancer. 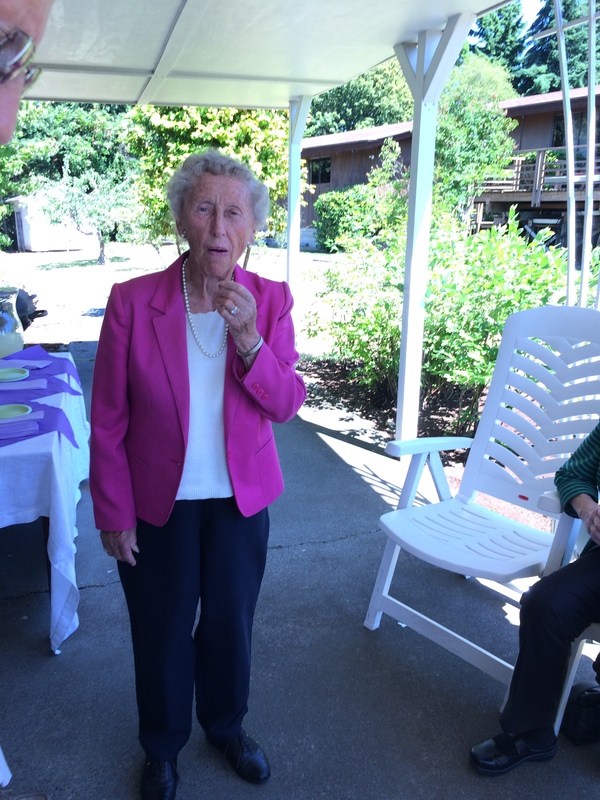 She was given 6 weeks, but that has passed and although she was walking very slowly and with difficulty, her grand daughter brought her here for a short while. Not sure about the other ladies, butI know Mom would be pleased June came. 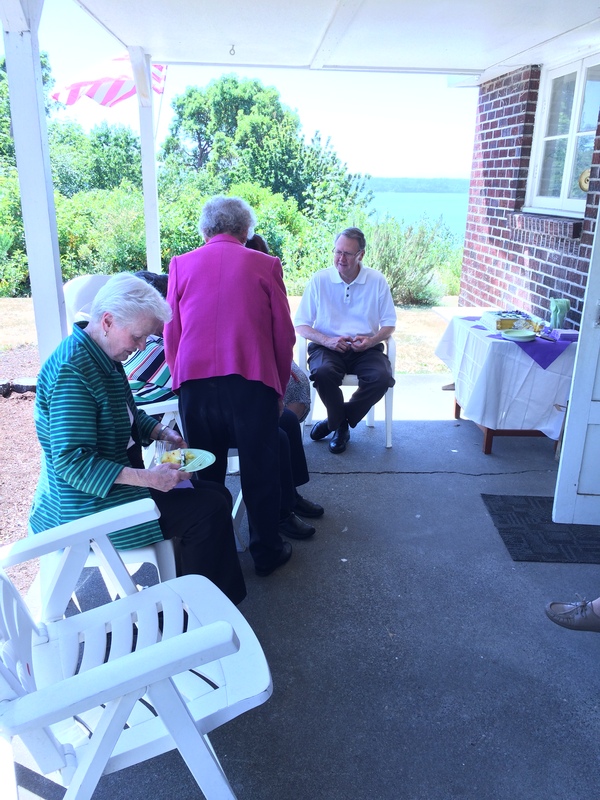 Unfortunately I didn’t have pictures of everything thing and everyone – we had people on the porch, at the dining table and in the living room – it went very well. 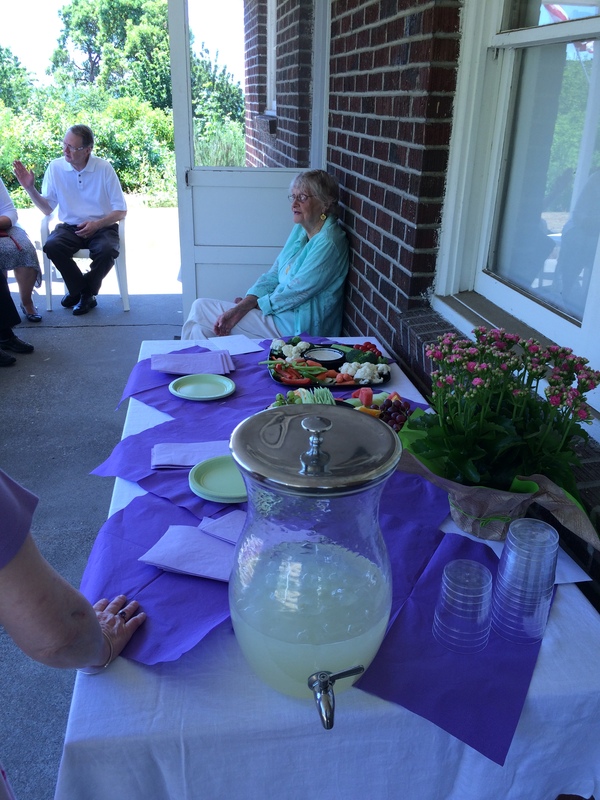 I am very happy people came and had wonderful things to say about Mom; I think she would surprised how much people liked her and enjoyed being with her. It was a perfect sunny day, about 75 with a cool breeze – I couldn’t have asked for better weather. it has taken me some days to begin to sleep comfortably, I was overtired, stiff and sore Sunday night. The shoulders and neck have been stiff all week – not sure what that is about but I will work through it. 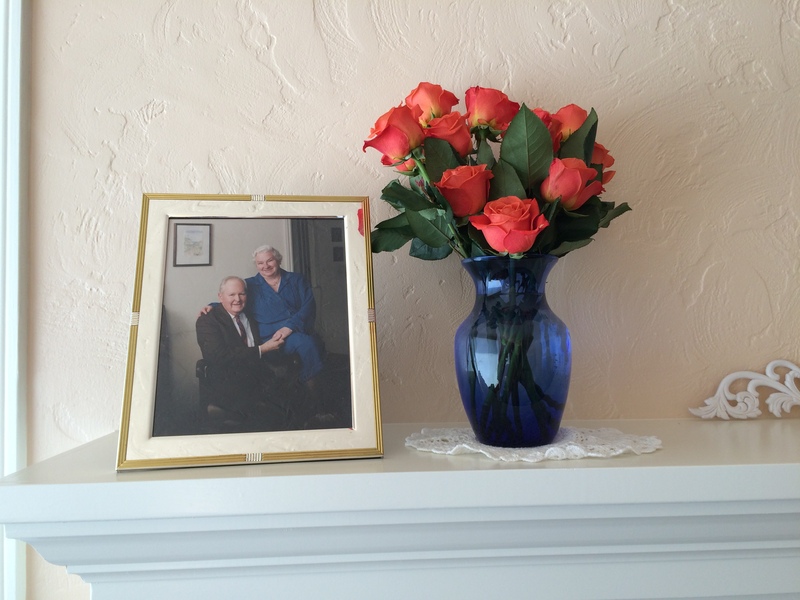 It was a special day for Mom and the last thing I can do for her. Now it is my time and I am looking forward to what shows up next.